Learning to perform the backroll entry is an important skill to master. 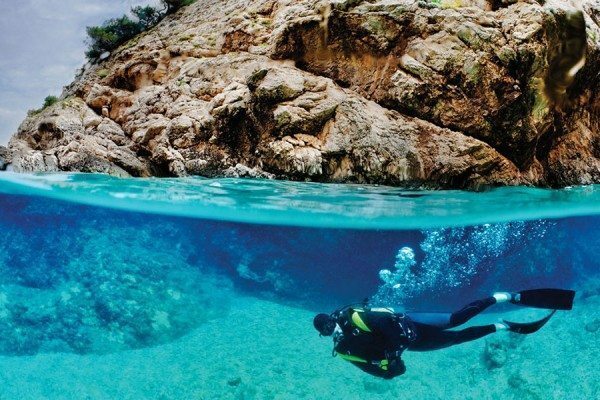 Many times dives are from a small boat or an inflatable boat without an entry/exit platform, making the backroll entry a necessity. New divers are often apprehensive about this particular skill. However, once the skill is learned and practiced, it is a simple way to exit small boats. [ONE] Before performing any entry, always make sure the entry area is clear of obstacles, including other divers. 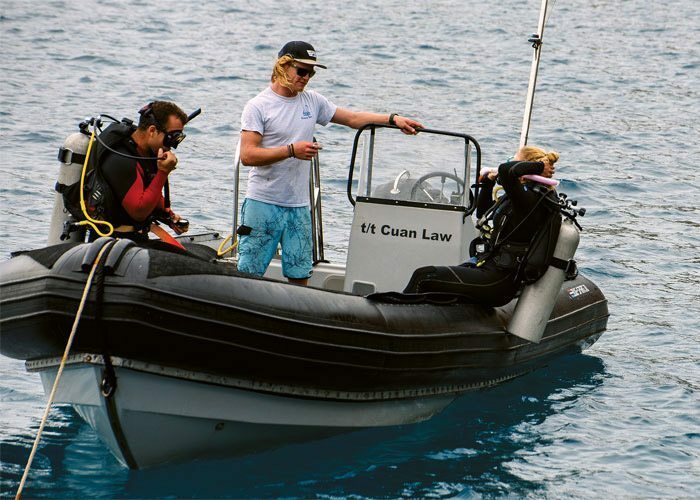 Once you are geared up and have completed a predive gear and buddy check, the backroll can be performed one at a time or by several divers exiting the boat as a group. Partially inflate your buoyancy compensator (BC). Check to make sure all gauges and hoses are secured so they won’t catch on anything during the backroll. Position your mask on your face and have your regulator in your mouth. 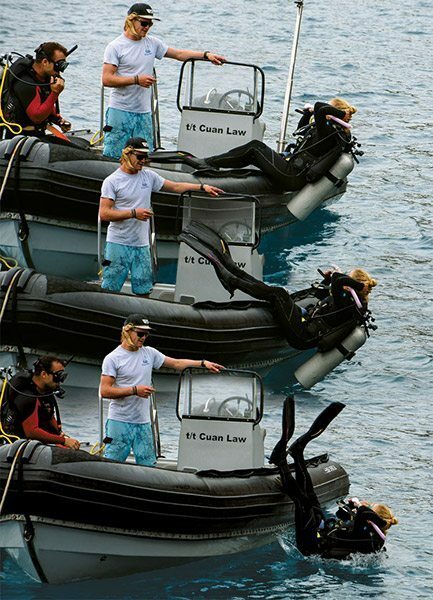 When the divemaster gives the OK to exit the boat, first check to see that the entry area is clear. Place one hand on the mask and regulator and the other hand on the back of the head to secure the mask strap. Exception: Some divers prefer to place one hand on the mask and regulator and the other hand on the gauges to hold them close to their body. Either technique is fine. The goal here is to keep your mask and regulator in place and avoid snagging any hoses as you enter. [TWO] Slide your body back so that you are seated near or slightly over the outer edge of the boat’s gunwale or pontoon. Tuck your chin into your chest to keep your head from hitting the tank valve. Place one hand over the mask and regulator, and the other hand along the back of your mask strap to help keep the mask in place as you perform the backroll entry. Slide your body back so that you are seated near or slightly over the outer edge of the boat’s gunwale or pontoon. Tuck your chin into your chest to keep your head from hitting the tank valve. This will also help prevent you from possibly doing a somersault when entering the water. After tucking the chin, keep your feet and knees together as you gently lean backward, rolling into the water. There is no need to forcefully flip into the water; just leaning backward will get the job done. When done properly, your legs will not continue rolling over your head as you enter. There is no need to forcefully flip into the water; just leaning backward will get the job done. Keep your feet and knees together and lean back so that your body gently rolls into the water. Congratulations. You’ve just completed a backroll entry from a small boat. After entering the water and resurfacing, get clear of the entry area while you check to make sure that your mask strap is in place and all your other gear is in order. You may wish to add a bit more air to your BC if you’ll be waiting at the surface for other divers to enter. Once you’ve established that you’re OK and floating comfortably, turn to the divemaster and give an “OK” signal. 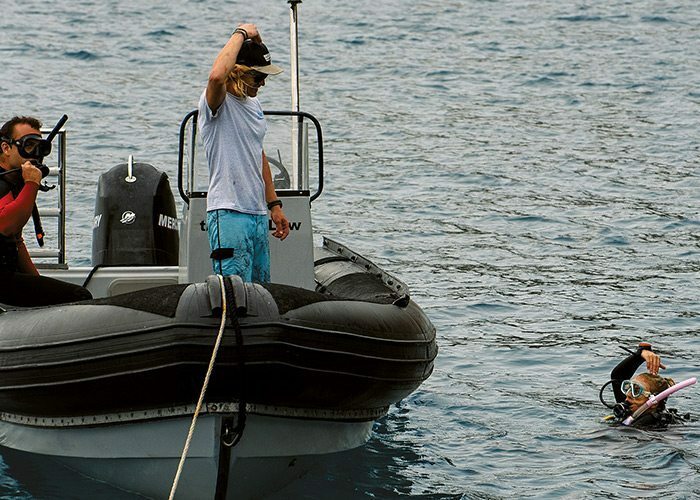 The best way to master this skill is practice — and you don’t even need a small boat, since you can simulate the backroll entry from the side of a pool, with or without scuba gear on. Simply sit on the edge of the pool with your back to the water and slowly fall backward into the pool while keeping your knees close together. After practicing the backroll, you’ll find it’s simple, not scary. [THREE] Upon resurfacing, get clear of the entry area and give the boat crew an “OK” signal.